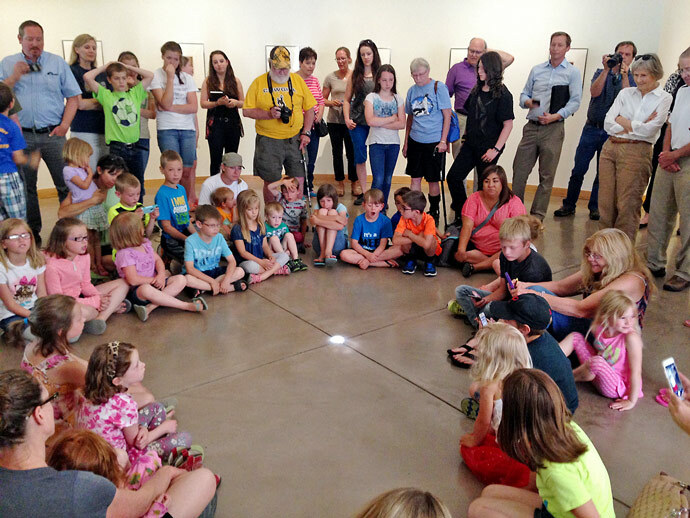 Join us for the University of Wyoming Art Museum's annual Summer Solstice Celebration! Tuesday, June 20, 2017 • 11:30 a.m.-3:30 p.m. Visitors are encouraged to arrive early at 11:30 a.m. to witness a unique architectural feature where a single beam of sunlight shines through a solar tube in the ceiling of the Rotunda Gallery and illuminates the silver dollar that is set into the center of the gallery's floor. This event occurs yearly at noon on the summer solstice where visitors are invited to celebrate the longest day of the year and the official beginning of summer. To continue the excitement the U.S. 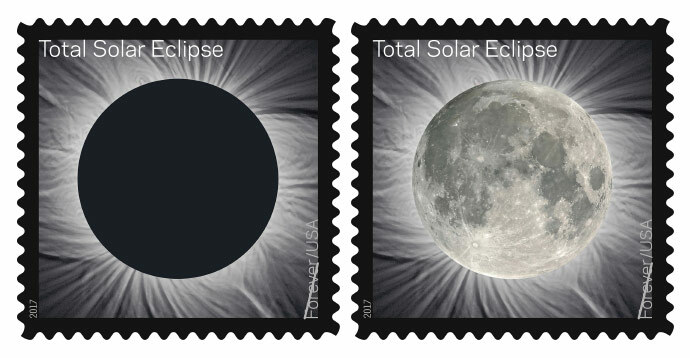 Postal Service invites you to the official first-day-of-issue dedication ceremony for the “Total Eclipse of the Sun Forever stamp” that commemorates the August 21 eclipse. The ceremony takes place at 1:30 p.m. in the lobby. This first-of-its-kind U. S. stamp transforms from an image of the eclipse to the Moon from the heat of a finger and reverts back to the eclipse once it cools. The eclipse and Moon photographs were taken by retired NASA astrophysicist Fred Espenak, aka “Mr. Eclipse” — who is scheduled to speak at the ceremony. 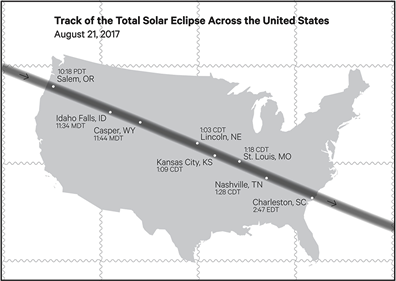 The back of the stamp pane shows a map of the eclipse path. 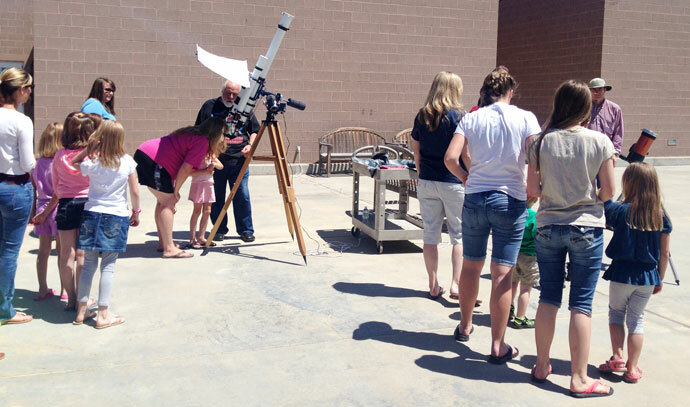 Members of the Laramie Astronomical Society and Space Observers, LASSO, led by Ray Martin will have a filtered solar telescope set up on the terrace for visitors to safely view the surface of the sun, until 1:30 p.m. The UW Geological Museum will be on hand with examples of a rare type of rock called anorthosite, found near Laramie, that closely resemble specimens found on the highlands of the moon, until 3:30 p.m.
FREE art making activities will be located in the Shelton Studio and the Museum Studio from 11:30 a.m.-3:30 p.m. In the Shelton Studio visitors can experiment with light-sensitive fabrics and take home their own creations made with help from the sun. Trained teaching artists will be on hand to guide the process and move between the studio and terrace. Kids of all ages can make their own drawings to expose onto the fabric, or use stencils and shapes provided. Downstairs in the Museum Studio, visitors will use the sky as inspiration to create real and imagined representations of what we see overhead and can imagine in the universe beyond. Teaching artists will introduce and guide participants in the use of interference paints. These paints contain small amounts of mica flakes rather than traditional pigments; and much like the wings of a bird, reflect light to create an iridescent effect.